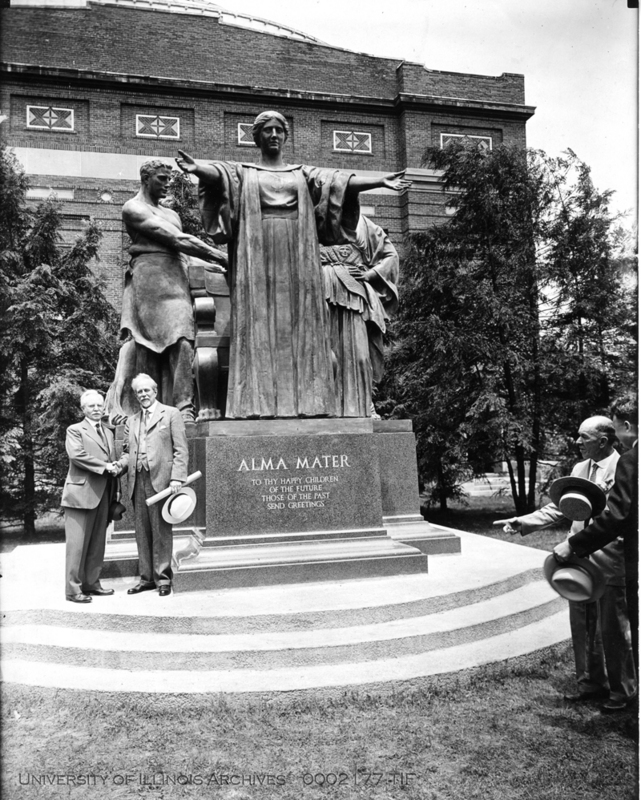 Artist Lorado Taft (1860-1936) created Alma Mater, a bronze group sculpture with a granite base. The figures stand at approximately 13'6" high. 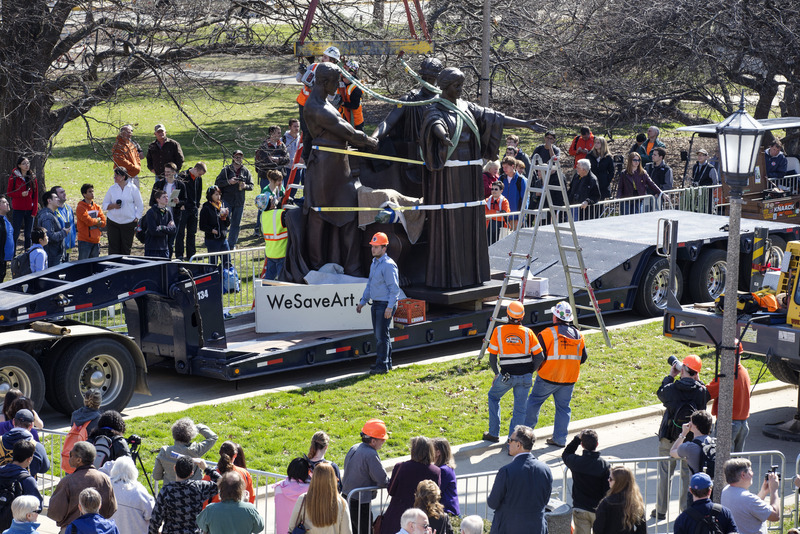 The artwork was acquired in 1929 as a gift from the classes of 1923-1929, the sculptor, and the Alumni Fund. Alma Mater can be found on the corner of Green and Wright streets. 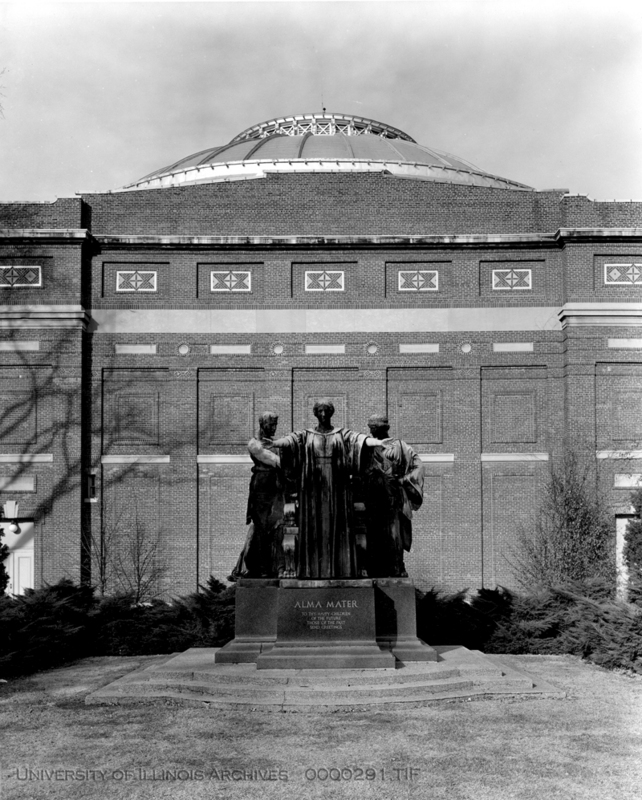 Since its dedication, Alma Mater has been a symbol of the University of Illinois. 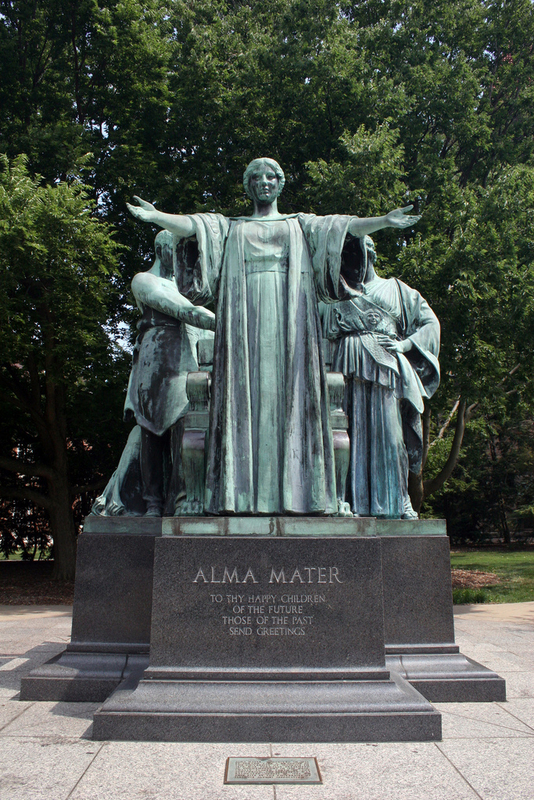 Affectionately referred to as ‘Alma’, she stands in front of her throne with open arms welcoming visitors, students, and alumni to the heart of campus. Although a bronze plaque on Taft's Alma Mater says he conceived the sculpture in 1922, his own letters reveal that he had wanted to do one like it, based on the university motto, Learning and Labor, as early as 1883. Actively seeking support for such a work in 1916, the year after Daniel Chester French made his grand Alma Mater for Columbia University, Taft warned that his statue must not be a "dwarf," that "it must stand at least twelve feet high." He told of his dream "to show 'Our Mother' as a benign and majestic woman in scholastic robes, who rises from her throne and advances a step with outstretched arms, a gesture of generously greeting her children. Our motto is fortunate," he added, "permitting me to introduce two more figures which while of the same scale will be subordinated in a sense. 'Learning' will be a modification of the so-called 'Lemnia Athena' which is distinctly archaic and admirably suited to the heraldic treatment. She will stand back at one side of the throne and will clasp hands with the sturdy figure of 'Labor' who will stand at the other side. Thus their hands will meet over the back of the chair." Taft's group, executed as envisioned, owes the leather aproned, husky personification of Labor to the nineteenth century Belgian populist sculptor Constantin Meunier's dockhands, ironworkers, and miners; the classically draped Learning to Phidias's colossal bronze Athena Lemnia on the Acropolis; and the central figure to French, whose Alma Mater is seated in a similar version of an ancient Greek klismos chair. At the base is the inscription: "Alma Mater / To thy happy children of the future those of the past send greetings / her children arise up and call her blessed." Taft's signature appears on the statue itself, but he said he had difficulty making his intentions understood. "My name will be on the bronze and I do not wish it repeated anywhere else. I am not doing this thing for personal glory, and refuse to be mentioned in the inscription. If it is done, I shall not come to the dedication. That is final." He did attend, and in a letter to a friend wrote that throughout his life he had "retained a romantic love for my Alma Mater.... 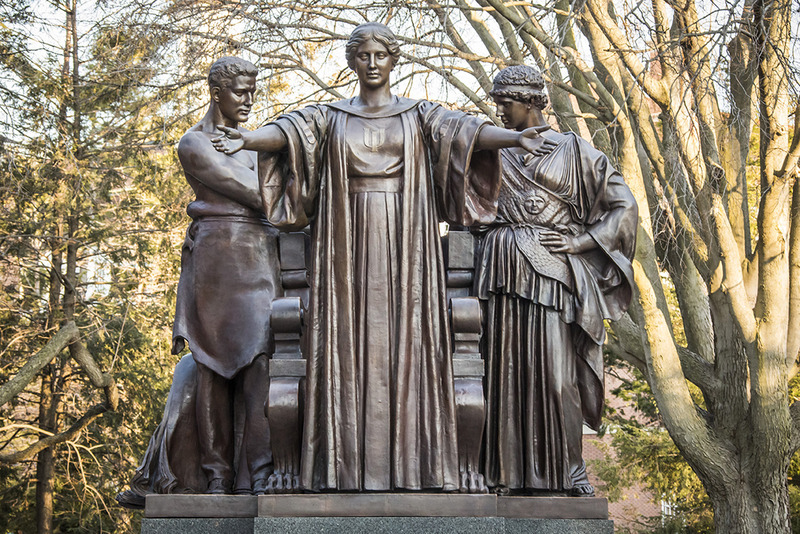 I once told Daniel Chester French that his noble Alma Mater, on the steps of Columbia's Library, was happily expressive of the reserve and reticence of the east; that a midwest mother must be more cordial. So I made my lady with wide-spread arms and smiling face . .. . I understand that [the young people in Urbana] have dubbed our group the Ideal Chaperone. I hope they may keep the bronze throne polished by their visits!" 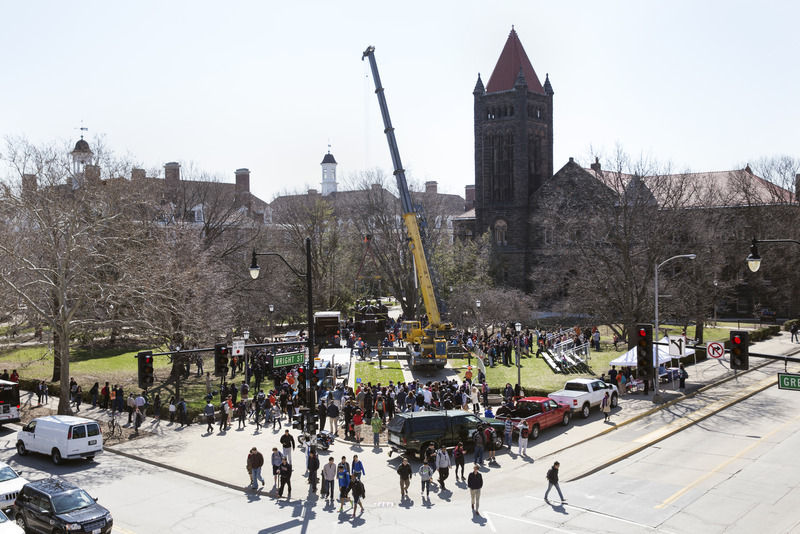 For thirty-three years the sculpture stood "temporarily" on the south campus just behind Foellinger Auditorium, but in 1962 the Alumni Association decided to move Alma to the space in front of Altgeld Hall, where she would be more visible. The plan was approved by the Board of Trustees and expected to occur in June 1962. However, public opposition to the move quickly spread. The Daily Illini ran an article on June 5, 1962 stating its distaste for the relocation, finding the placement to be in the "worst possible taste; it makes the Alma Mater a debased, commercial 'advertisement' for the University." 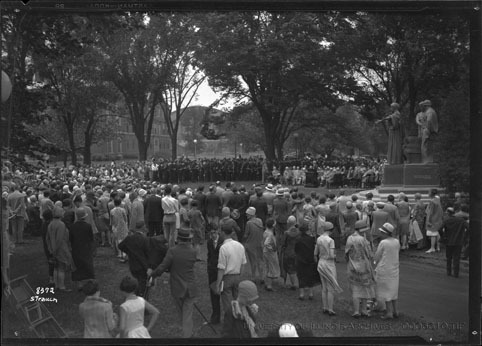 A public forum was called, and after ample discussion the Board of Trustees approved the move again, and on August 22, 1962 the statue was relocated in front of Altgeld Hall as previous planned. The monumental, dark-green weathered bronze group is wonderfully effective in beckoning visitors and students to campus, set as it is among Canadian hemlocks and flowering crab apple trees, nicely harmonizing in scale and spirit with the important building forming its backdrop: Altgeld Hall, the original university library of 1897. Taft himself had been a student at Illinois. After graduating with a master's degree in 1880, and having been deeply inspired by Gregory's Fine Arts Gallery, he studied for three years at the prestigious Ecole des Beaux-Arts in Paris before settling permanently in Chicago in 1886. He taught at the Art Institute of Chicago, lectured and wrote extensively on the history of art, took a leading role in the Central Art Association, a group dedicated to the encouragement, exhibition, and sale of American art-conservative American art-and for some forty years produced large-scale sculpture with a loyal coterie of pupils and assistants in his Midway studio on the University of Chicago campus. Early public recognition came with two decorative groups he made for the Horticulture Building at the 1893 World's Columbian Exposition in Chicago. Following that, he earned accolades for his many sensitive works, among them the Solitude of the Soul in the Art Institute; the experimental fifty-foot cast-concrete form of Black Hawk in Oregon, Illinois; the many-figured Fountain of Time on the Chicago Midway; and the Young Lincoln opposite Urbana High School. Taft retained close ties with the University of Illinois. Named non-resident professor of art in 1919, he came to campus each spring to give a series of illustrated talks. At the unveiling of his Alma Mater in 1929, the university granted him an honorary Doctor of Law degree and, a year later, with a large endowment subscribed to by friends and alumni, established the ongoing Lorado Taft Lectureship on Art. On August 7, 2012, Alma Mater and her Learning and Labor companions were taken from their granite pedestal for cleaning and restoration. More than 1,000 bolts were replaced, the exterior surface laser cleaned, and the green patina that had resulted from years of water damage and corrosion was removed to return Alma to her original bronze finish. Conservator Andrzej Dajnowski, the director of the Conservation of Sculpture and Objects Studio, Forest Park, Ill., has recommended an ongoing maintenance program requiring the application of a wax compound every two years. In all, the Alma conservation project cost about $360,000 and took nearly two years. 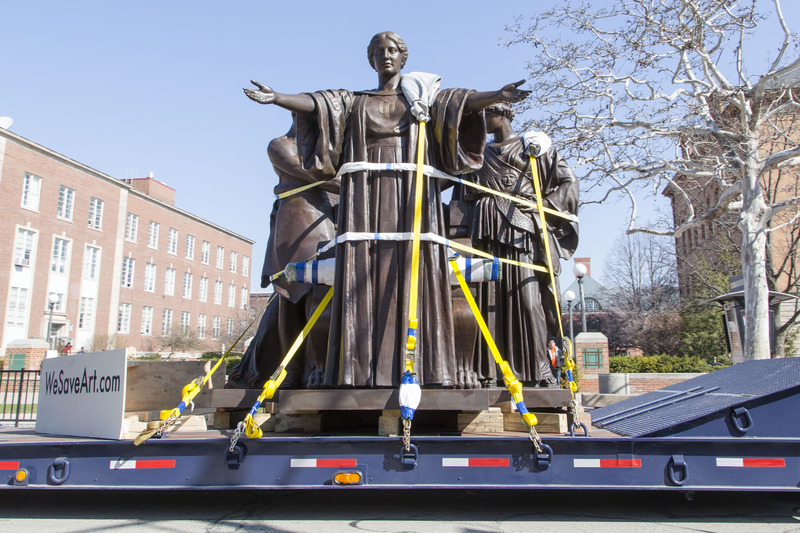 On April 9, 2014, Alma was reinstalled to her location at the corner of Green and Wright Streets. Follow Alma on Twitter @Illinois_Alma. 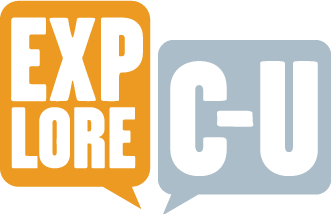 Muriel Scheinman, “Alma Mater,” ExploreCU, accessed April 21, 2019, https://explorecu.org/items/show/183.